Rahul Dravid: Why did he left the Captaincy? Why did he left the Captaincy? From the time he announced it, Rahul Dravid's decision to step down as captain of the Indian cricket team seemed to be far deeper than the public reason he gave for it. He may have told the BCCI chief Sharad Pawar that he wants to concentrate on his batting. But only those unaware of the dirty politics rampant in Indian cricket since time immemorial, will take Dravid at his word. It is not difficult to see Dravid is not telling the truth for obvious reasons. Being a thorough gentleman, Dravid would probably never disclose the actual reasons for his abrupt decision, considering he had just led his team to a Test series win on English soil after 21 years. 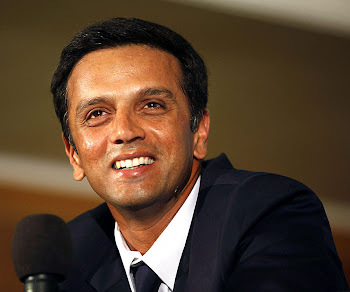 A key member of Team India told rediff.com on condition of anonymity that Dravid was "feeling suffocated", not because of the weight of captaincy affecting his batting, but because "certain people from outside tended to dictate to him as to what he should do and what he shouldn't" as a captain. "You could clearly see Dravid had been feeling some sort of indirect, mental pressure from the always powerful Mumbai lobby, which has again swung into action since Pawar has become the BCCI president," he added. And one of those outsiders is chairman of selectors, Dilip Vengsarkar, who also hails from Mumbai. It is no secret now that Vengsarkar was not happy with Dravid not batting at number three in the One-Day Internationals and sending others instead. Rather than advising the Indian captain in person, Vengsarkar expressed his displeasure and pointedly criticised him on this issue after the sixth One-Day International at Lord's, where India levelled the seven-match series 3-3. "Why on earth should Vengsarkar criticise any of Dravid's decisions? It's none of his business. It's Dravid, and not he, who is the captain. Vengsarkar's job is only to select the team. People like Vengsarkar and others of his ilk weren't making Dravid's task easier. Such criticism was uncalled-for when India was trying to come back in the series," said the Indian player. "I don't know if Vengsarkar has made any critical statement about whether Dravid should bat at No. 3 or at any other position. But if he really has, I think he shouldn't make such comments in public. Rather he should meet the players personally and tell them whatever he wants to say," a high profile BCCI official reluctantly said. Another BCCI bigwig told rediff.com that he felt "sorry" for the way Dravid was "taken for granted" by a "particular section of the BCCI, including the chairman of selectors" despite his "best and successful efforts" to "rebuild" the team after the World Cup debacle. "They gave him a specialist bowling coach, a specialist fielding coach, but not a full-time coach. Instead, they gave him a 73-year-old former player, a true blue Maharashtrian, as a manager, who couldn't remember even the names of the players properly. The team given to him was also not entirely of his choice. As always, they gave him Ajit Agarkar,an eternal blue-eyed boy of successive Indian selectors. Agarkar's lack of talent and performance is legendary and it was no exception on the England tour either," said the bigwig. Earlier, Pawar did not show any interest in making Gundappa Viswanath, of all people, the coach of Team India when the master batsman expressed his desire to serve it. Instead he appointed Borde the manager. A still furious Erapalli Prasanna recently told this correspondent that Pawar questioned his ability to coach promising spinners in the country. The BCCI chief said soon after Dravid handed him his resignation that he did not try to "persuade" him after he was "convinced" by what the outgoing Indian captain "explained" to him. So, instead of persuading him to continue to lead the country, Pawar decided to "respect" his decision to quit the captaincy. Indeed, inscrutable are the ways of the BCCI. What lends further credence to the theory that the Mumbai lobby had been secretly working against Dravid is Sachin Tendulkar's comments on the England tour itself that he hadn't "enjoyed" his previous innings as the Indian captain. Tendulkar was reported to have made such remarks on Sky TV's serial Indian Pioneers in the middle of the Test series. And within hours of Dravid tendering his resignation from the captaincy the BCCI has sounded out Tendulkar to take over the reins of Team India. A man of quiet dignity, Dravid has always played the game and steered clear of controversies. He could withstand even a sustained attack from the media and former cricketers-turned-critics for having not enforced the follow-on on England in the third and final Test at The Oval and squandering a golden opportunity of winning the series 2-0; but certainly not the skilful political manoeuvrings the BCCI bossess are masters at. Dravid has proved his leadership ability in his own humble way despite the limited resources at his command and the outside pressure he was invariably subjected to. However, a person of his temperament can neither stand all this nor continue any longer in such a scenario, especially when he has realised that captaincy has begun to affect his batting. With the tough series coming up against the world champion Australia, first in India and later Down Under, Dravid has taken a wise decision to relinquish the captaincy on a winning note. His batting is far too important to Team India than his captaincy. Click here to view his record as a captain.